Comparto mi selección de herramientas de representación gráfica de información. Todas ellas ofrecen una licencia gratuita. Let’s paint the data !! Genial presentación de Face, the co-creation agency . Facilitada por Ladislau Girona. Genial selección de herramientas de visualización de información realizada por DataVisualization.ch. Selección de herramientas de Visualización de Información (realizada con Mertxe Pasamontes). I almost didn’t make a best-of list this year, but as I clicked through the year’s post, it was hard not to. 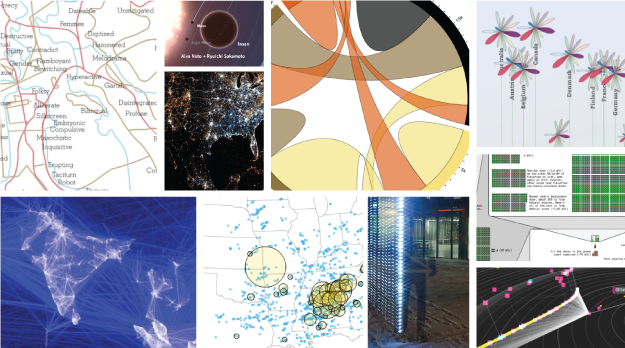 Iflast year (and maybe the year before) was the year of the gigantic graphic, this was the year of big data. Or maybe we’ve gotten better at filtering to the good stuff. (Fancy that.) 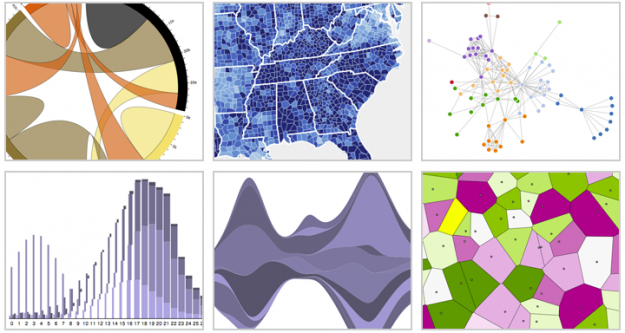 In any case, data graphics continue to thrive and designers are putting more thought into what the data are about, and that’s a very good thing. So here are my favorites from 2011, ordered by preference. The order could easily scramble depending when you ask me. Who knew carrying around a stick that detects WiFi vertically could be so informative? 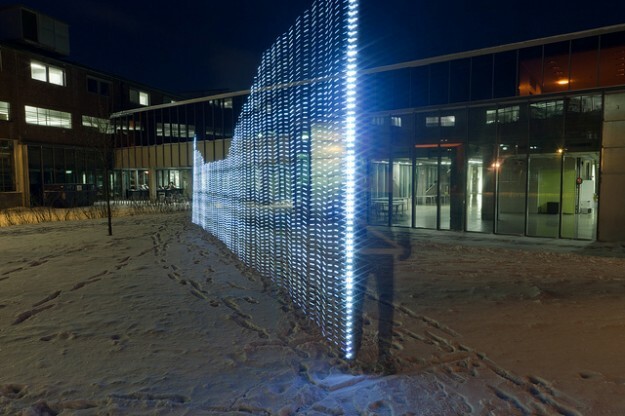 Mix in long-exposure photography, and the invisible networks all around look tangible. I feel silly putting this project so high on the list because it is so simple, but its simplicity is also part of why I like it so much. Media artist Roger Luke DuBois used online dating data to show the uniqueness of cities in America. 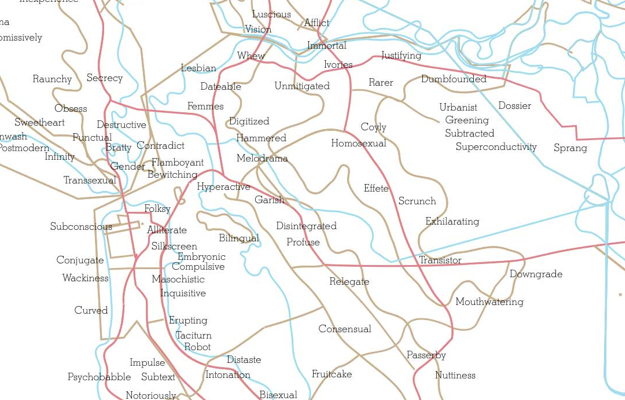 In place of city names are the words that people in those cities used more often in their online dating profiles than anywhere else. The result was an exhibit mostly on paper, showing what set cities apart. It’s not often that we get to see how geographic regions are unique at such a personal level. 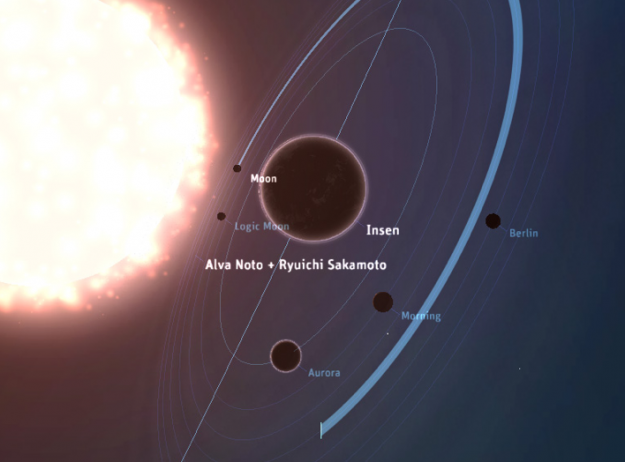 From Bloom, Planetary is an iPad app that visualizes your iTunes music as a solar system, bringing your data into a more playful and exploratory context. The solar system is your music collection, stars are artists, and planets are songs. Planetary was a hit at launch, and it’s only a small sample of things to come I am sure. The OECD has a lot of data about countries, and it can be hard to make all of data accessible at once. 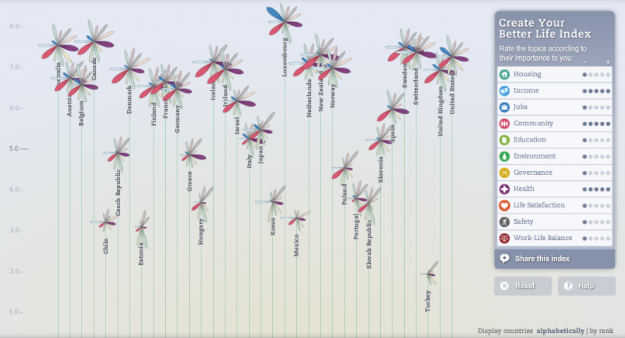 Moritz Stefaner and Raureif, in collaboration with the OECD, did this with the Better Life Index. You’re even able to pick metrics to build an index yourself. 6. Whose Size 8 Are You Wearing? This one from The New York Times amused me. My wife always has to try on so many jeans and once she finds a brand, she tends to stick with it for years. Now I get it. 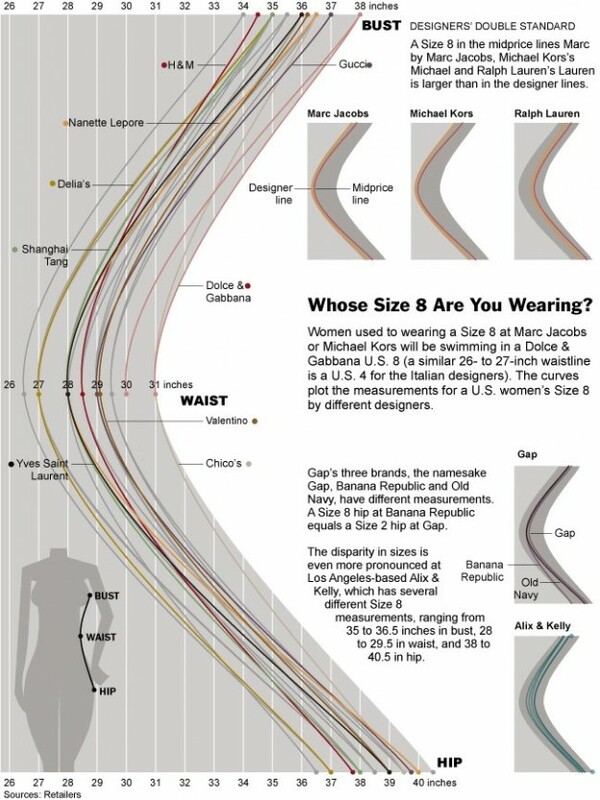 Sizes on women’s clothing makes no sense. With the troubles in Japan caused by mother nature, possible radiation hazards were in the news. Most accounts were anecdotal though, and a lot of numbers were thrown around. 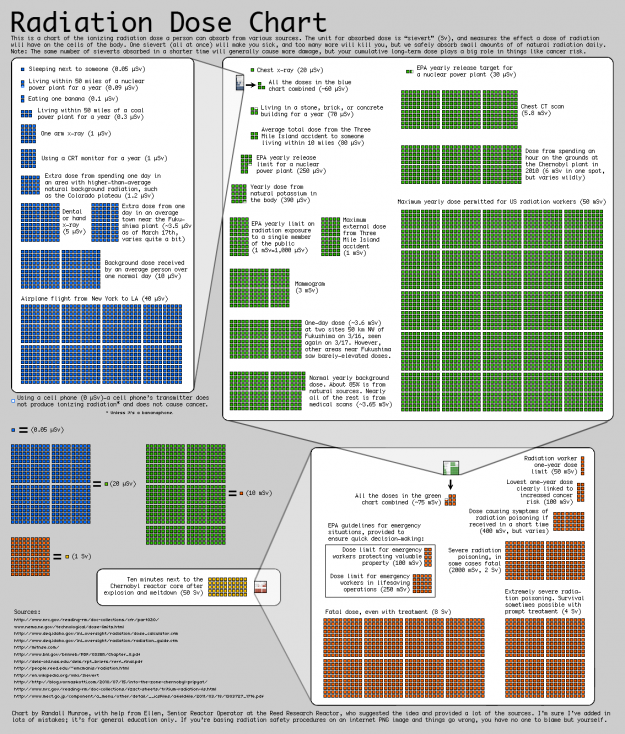 Randall Munroe of xkcd put together this chart to put it into perspective. What Munroe lacks in design tech he makes up with rigor. Similarly, after the tornado in Joplin, Missouri killed more than 100 people, The New York Times put things into perspective. 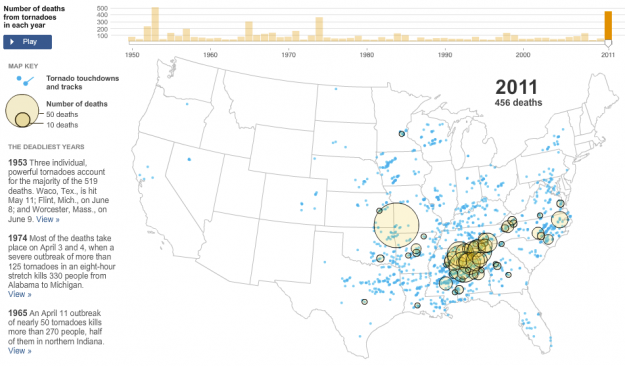 An animated and interactive map showed tornados and where they touched down, starting in 1950. The way that people use web services has gotten a lot more interesting with the growth of mobile tech. People aren’t just interacting via a standing desktop anymore. 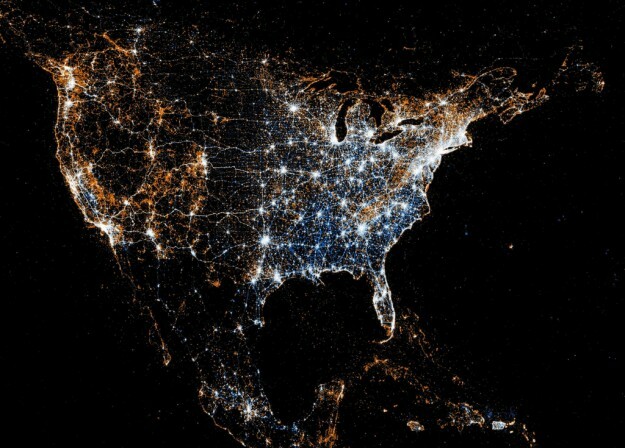 Eric Fischer compared Flickr and Twitter usage in this series of maps. White indicates where people used both, blue is just Twitter, and orange is Flickr. Facebook intern Paul Butler’s map came out in 2010 just after I made my top picks for that year. 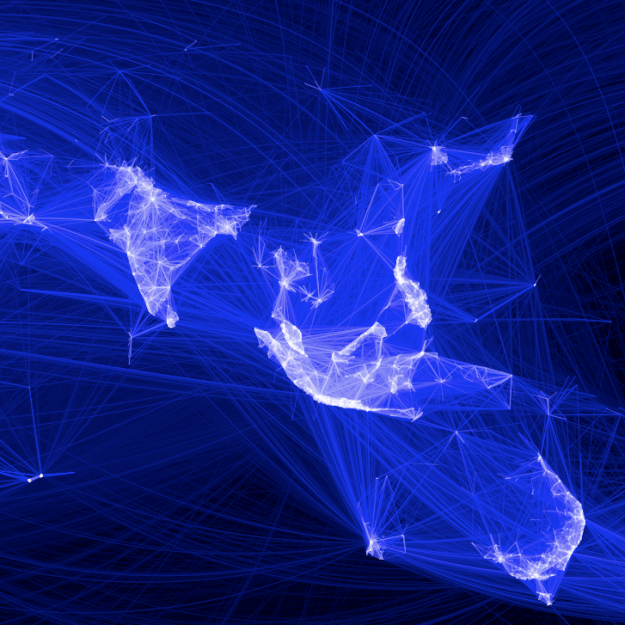 The map shows the reach of Facebook, and more interestingly, I think, where Facebook isn’t used. A number of follow-up maps came out of it. I also wrote a tutorial on how to do the same with your data. NASA mapped tens of millions of fires worldwide over the course of a decade. Fires come, and forestry goes, and then comes back again. I was surprised the animation wasn’t more popular when it came out. Probably would’ve spread a lot more with a little more production. There was an idea floating around that if you continuously follow the first link on Wikipedia pages, you will always end up at philosophy. Jeffrey Winter put together a mashup to try out the idea, and whattaya know, everything does lead to philosophy. Well, almost everything. While the short film about a lonely desk toy traveling cross-country via Google Streetview isn’t exactly a data visualization, it deserves a shout. I mean, it uses maps, so that’s enough. Just watch it. Gareth Lloyd showed the history of the world in 100 seconds, using geotagged entries on Wikipedia. Because of that, the data has a slant towards Europe and the US, but it’s interesting to watch nevertheless. Sharing on the Web is often depicted as time series charts and bar graphs, and measured by number of retweets and likes. There’s more to it than that. 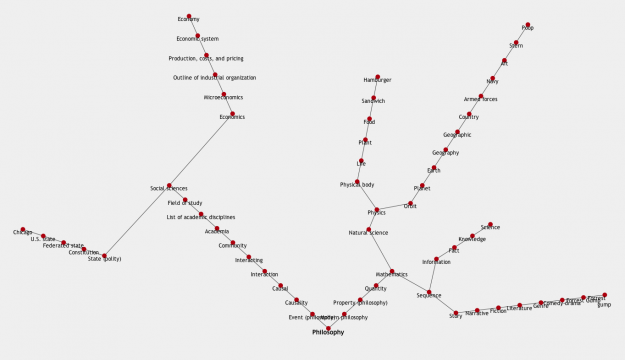 The spread of a story is organic, a lot like how things spread in the physical world. 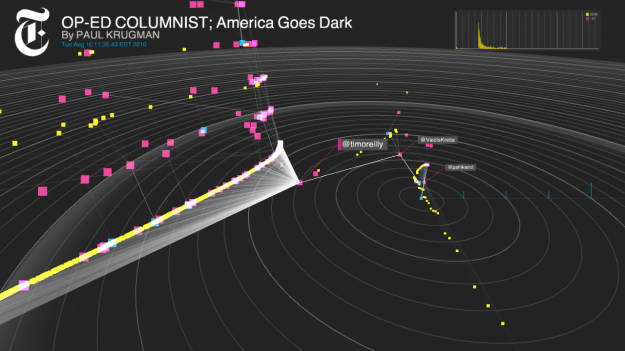 Mark Hansen, Jer Thorp, and Jake Porway, as parts of the New York Times R&D Lab created Project Cascade to visualize how people share New York Times Stories. Those are my picks for 2011. Your turn. We are swimming in data. Too much to comprehend, at times. Matthias Shapiro walks us through the visualization techniques that can be used to figure out what a data set is trying to tell us. This work is licensed under a Creative Commons Attribution-Share Alike 3.0 United States License. Filming by Davis Audio Visual in Salt Lake City, Utah.